Slide into this moc and relax! Limited edition numbered series to 500. 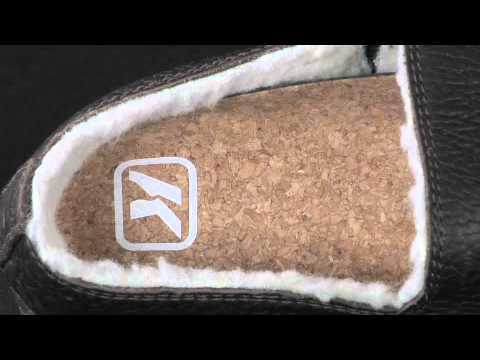 Comfort moisture-wicking shearling lining, anti-microbial EVA foam with cork footbed. The best apres-fish, apres-ski, apres-three-day-bender shoes you can find. The most comfortable thing you can wrap around your feet! I got these BisonMoc's for a trip to Brazil in which the weather and camping situation didn't promote much use. Since that trip I have found them to be perfect. I wear them almost daily and especially if I'm going camping. The perfect slip on shoe that is warm and comfortable. Can be worn with or without socks. The durability is awesome! Rubber toe guard to help protect your feet as well as incredible traction. I'm looking forward to trying them out in the snow this year. I would recommend these to any fly fisherman, skier, camper, or snowboarder. They are a great after shoe, keeping your feet toasty and comfortable. My Favorite Shoes!! Great Comfort and I Love The Way They Look. I had wanted these for quite a while, and finally placed an order for one at my favourite Outfitters in Oregon. They were to be used in lodges where they don't want their floors marred, but also just getting to a fishing spot before changing into waders. Great also for lounging around the yard. It has a tough, weatherproof and durable finish, but also looks great, and it's very cosy with the fleece lining. It's easy on/off with the elasticated sides and has a nice wide shape to accommodate socks. The grip is sure in case of wet weather. Destined to be a favourite of mine. I haven't had kit long enough to rate long term durability, but given its build I'm sure this will be the case. I love these things, so dang comfy. I love them!!! I've tried quite a few wading boots but none have fit me better or been more comfortable and lightweight than my Korkers. I love the interchangeable soles and quick cinch lace system. I will never wear any other brand!